Design ideas for a Japanese koi pond and backyard garden water feature. Koi ponds and water gardens have been popular for hundreds of years because of their beauty and serenity. Koi are traditional symbols of good luck in Chinese and Japanese culture, with each variety representing different aspects of life such as love, wealth, or happiness. These fish are hardy and do very well in controlled environments like backyard water gardens. Keep reading to find out more about how to put together a healthy environment for these stunning fish. You want to make your lawns and landscapes — the places where your children play — as safe as possible. Our natural pond care products are designed to correct common problems — algae growth, odor, cloudy water, ailing plants — without harmful chemicals. With their playful demeanor and rich history of bringing good luck, koi are the perfect addition to any backyard water garden. Dating back centuries to China and Japan, these fish were originally kept as pets by emperors because they were thought to transform into dragons. Nowadays, koi ponds are prized for their beauty and tranquility. The word “koi” in Japanese means “affection, love, and friendship,” so the presence of koi in a backyard pond has become a symbol of luck and love. In addition to good luck, koi represent prosperity, courage, success, longevity (some species have a lifespan of up to 200 years), and perseverance. Koi are very colorful, and each color combination represents a different aspect of life. For instance, koi with a white body and red spots symbolize a successful career, while an all-gold fish represents wealth. The red and white “lipstick fish” (named as such because of the red coloring around its mouth) is prized for its representation of lasting love and relationships. Koi are also tied to the yin-yang symbol, an emblem of happiness and harmony. There are many important steps to take when building a proper environment for your koi. A good filtration system is key to maintaining the health of your fish. A high-quality filtration system includes five main components: a bottom drain, filter, skimmer, pump, and UV light. Ponds should have at least one bottom drain per every 6,000 gallons of water. The purpose of the drain is to remove waste and other debris from the water and pond floor. At the surface, the skimmer works to remove dust, dirt, and scum from the top of the water. Swimming pool skimmers are usually safe and effective for koi ponds. The pump is the heart of your koi pond, powering both the skimmer and filter. External pumps are usually favored over internal pumps because of safety and convenience. The filter and pump need to work well together in order to create a healthy environment. When choosing a pump and filter, it’s important to take into account your projected fish load – in other words, how much waste your fish will put out when they are fully grown. Multi-chamber filters are usually the favorite choice for koi ponds. These filters contain several media chambers and one or two settling chambers, and they must be regularly cleaned in order to work effectively. Finally, ultraviolet lights are invaluable to koi ponds because they inhibit the growth of algae. This keeps the water clear and prevents the green algae-induced hue that tends to happen over time. The first step to taking care of your koi is to maintain a healthy water environment through the use of a good filtration system. After that is in place, there are a few more steps to take to make sure your fish are happy and comfortable. One of the main sources of koi death is lack of oxygen. Fully grown koi demand lots of oxygen, and it can be difficult to find the right balance of fish and plants within your pond. When stocking your pond, it is important to take into account the amount of oxygen each koi will eventually need. Predators are another risk to the koi in your pond – cats, birds, and raccoons all love the taste of koi. By making your pond at least four feet deep, you can protect your fish from most curious wildlife. Koi are very susceptible to parasites and infections, but maintaining excellent water quality is usually enough to keep away these problems. Parasites can be taken care of with an anti-parasitic medicine added to the water, while infections are usually prevented with a healthy diet and a clean, safe environment. Plants make great companions to koi in a water garden – they create shade and oxygen, keep algae growth under control, and help regulate water temperature. However, koi will easily dig up plants in order to eat the roots. You can prevent this by constructing a barrier (or plant shelf) around the plants to keep the fish at bay. 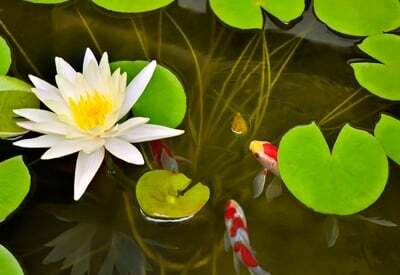 Floating plants like water lettuce or water hyacinth are great for koi ponds because they are very easy to care for and provide fish with lots of shade. Water lilies are one of the most popular choices among koi pond enthusiasts because they are hardy and beautiful. Lotus are another great choice, but they do best in larger ponds. A few favorite submerged plants include fanwort and ludwigia, which are fast-growing and produce lots of oxygen.